Jeep YJ gas tank mod - It's a know fact that many YJ's came out with 15 gallon tanks. There was an option for an upgrade to a 20 gallon for an upcharge. Here is a sneaky trick that Chrysler pulled off. Customer orders a new Jeep. Gets many upgrades such as air conditioning, nice sound system and even upgraded interior. Then they get to the 20 gallon upgrade option on the order list. Oooo .. gotta have that so I can enjoy driving longer between fill ups. The tank upgrade consisted of pulling a plastic tube out of the tank. Sure they swapped in a 20 gallon sending unit to make sure the gauge read correctly. But the actual tank was the same exact tank, minus a little tube in the vent hose. Jeep YJ gas tank mod - I like the end result! Doing the 15 to 20 gallon YJ tank mod is fairly straight forward. But not always easy. But it is free! Just a little bit of time involved. There is a video at the bottom demonstrating the mod. Remove the license plate mechanism. Remove the screws around the fuel filler plate. Under the Jeep trace the hoses to the tank and loosen the hose clamps. Remove the hoses from the tank. Once the hoses are off the tank. Remove the whole assembly by pulling the hoses through the hole in the tub. Now the real fun begins. Look at the two necks protruding out of the tank. Notice how the smaller one is thicker walled than the larger diameter one? That's because there is another tube inside the vent neck (smaller diameter neck). It needs to come out. Tap or wedge a small screwdriver between the two layers. Once you have split the tube from the neck. Cram the point of needle nosed pliers between the layers. Grip tight and pull out that plastic tube. You might want to wear gloves to protect your hands in case the pliers slip off the vent tube. 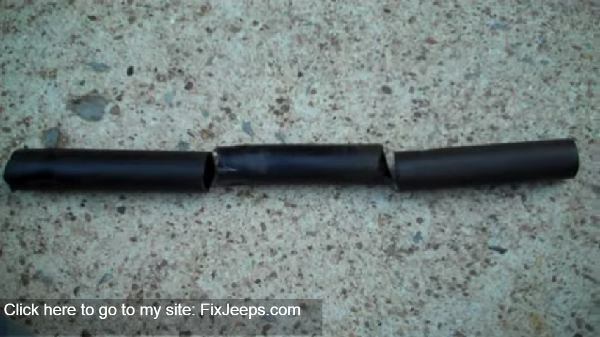 Once the vent tube is out far enough, get some pliers that really grip to finish pulling the tube out. As you can see to the right. I had to cut this one in 3 sections as I pulled it out. Once the vent tube is completely out. Measure a short section of the tube about the same length as the vent neck. Cut that short section of tube off and tap it back into the vent neck. This provides support for the neck wall. I don't really know that it's needed. But it doesn't hurt anything either. Re-install the license plate assembly. Now that you have performed the Jeep YJ gas tank mod. Go filler up! I have to point out one important thing that may trigger some OCD issues for some people. The fuel hand will show full for a long time. This is because the fuel level is higher than the 15 gallon sending unit can accommodate. So, until the actual fuel level is less than 15 gallons in the tank, the sending unit and therefore the fuel gauge will not move. Once it starts getting below 15 gallons the fuel hand starts dropping as it should. If you want to spend the money, you can buy a 20 gallon sending unit. Drop the tank and install it. I run the 15 gallon sending unit and it reads fine. Even when it gets real close to empty mine is still accurate. The only down side to this gas tank mod it that it now costs more to fill up. But I can go longer between those fill ups so it doesn't actually cost anymore over all. I am very happy I did this tank mod to my YJ. See the YouTube video below for a great tutorial.